Deodorant specially created for those who have sensitive and delicate skin. The formula includes organic, natural ingredients like moisturising organic rice milk. It has a subtle scent and doesn’t clog pores, while excluding aluminium salts. The perfect way for those with sensitive skin to stay feeling fresh. Directions: Roll deodorant onto clean, dry underarm skin. Water (Aqua), Alcohol*, Aloe Barbadensis Leaf Juice*, Triethyl Citrate, Sodium Lactate, Fragrance (Parfum)**, Zinc PCA, Zinc Ricinoleate, Oryza Sativa (Rice) Extract*, Helianthus Annuus (Sunflower) Seed Oil*, Hamamelis Virginiana (Witch Hazel) Water*, Salvia Officinalis (Sage) Leaf Water*, Glycerin, Xanthan Gum, Potassium Cetyl Phosphate, Sodium Cetearyl Sulfate, Dipotassium Glycyrrhizate, Hydrogenated Lecithin, Limonene**, Linalool**, Citronellol**, Citral**, Geraniol**, Benzyl Benzoate** * Ingredients from Certified Organic Agriculture ** Natural Essential Oils *** Fair Trade. 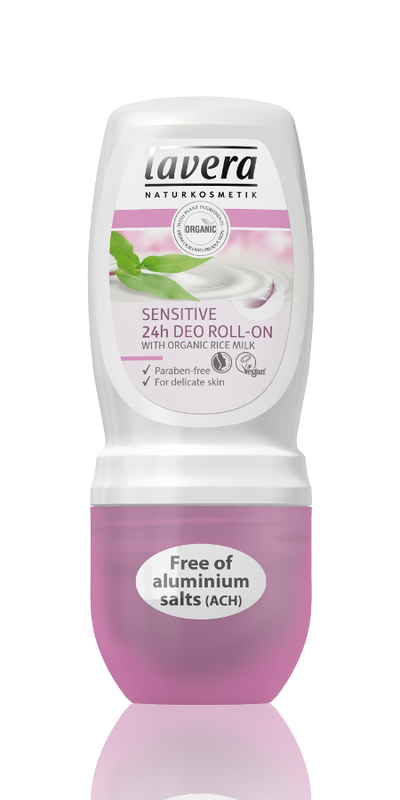 There are currently no questions to display about Lavera Roll on Deodorant - Sensitive - 50ml. Lavera is a leading supplier of organic natural skin care and bodycare products for the whole family - women, men, children and babies. Lavera use raw plant materials, as much as possible from certified organic agriculture. Their natural bodycare products are 100% free from synthetic perfumes, colourants and preservatives. Exclusively through tests with volunteers, skin specialists and allergists, Lavera ensure skin compatibility and effective cleansing. They do not conduct any animal testing and register relevant products with the Vegan or Vegetarian society where appropriate.